My god, were the advance reviews of Demolition bad. I mean, so incredibly bad that the nearest comparison would be Turbo in ’86, but even back then there were a few early reviewers who gushed for “the new Priest sound.” And so it went, at least until Demolition found its way into the hands of average music fans, Voila! Now everyone thinks Demolition is a masterpiece, go figure. To my ears, Demolition is the perfect middle of the road Priest disc with as much of Point Of Entry as Painkiller or Screaming For Vengeance comprising its innards. No, it is not as heavy as Jugulator, but Christ, what could be? Was it purposefully directed toward the wider Priest audience? Of course it was, and what is wrong with that? I mean I still like hearing “Victim of Changes” mashed up against “Blood Stained” as much as anything else in the Priest cannon, so the varied textures of Demolition are more then welcome here. So, I say “Bravo!” to Glenn Tipton, KK Downing, Tim Owens, Ian Hill and Scott Travis, for doing honor to the Judas Priest name, its legacy and the metal world in general by avoiding the big label sellout that so many predicted when they signed to Atlantic. 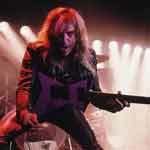 Priest guitarist Glenn Tipton has had his fare share of personal and professional valleys to traverse to get to the top of the metal mountain that is Demolition, a record that, me thinks, will eventually be spoken of with the same reverence as Screaming For Vengeance or British Steel. Tipton phoned from the Priest tour bus with general metal greetings and a fervent reassurance that the Priest metal machine is continuing to steam at full boil. GLENN: Yeah, yeah, we quite like it. We watch movies and drink beer. 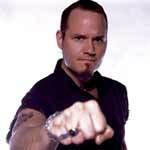 KNAC.COM: That sounds very much like what a rock and roll band should be doing, I must say. GLENN: Yes, my father was ill for the past two or three years and he died last year and that has taken a lot of my time really. KNAC.COM: (As I bang my head against the desk for not remembering) People do tend to miss the fact that you are not only a musician, but a human with a life outside of the group, I am sorry. GLENN: I can’t say that it stopped me dead in my tracks, but it has always been that Priest took the priority even over my family. I give my family all of the time that I can, but obviously when you are away on tour you can’t see them, you can’t be with them but there is a point in your life when your priorities are actually focused on your family life and your own personal life, and the band has to take second place, though that has been very rare with Priest. As I say though, the last couple of years I have been slowed down a bit. KNAC.COM: I would think it only natural that some of that would creep into the music that you made for this record? GLENN: No, I wouldn’t ever blame that. It may have been a little more difficult and have taken a little more time but basically I think that the album turned out the way that I wanted it to. KNAC.COM: When things do get heavy at home, does Priest also provide an escape of sorts for you? GLENN: No, not really. I think that Priest is just a love, a sincere love for metal. I think there are a lot of bands that reach a point where they go through the motions, but we have never lost our deep love affair with heavy metal and Priest music, so it is very genuine in our case and that is why we have been around so long, and people realize that. KNAC.COM: Taking that and moving to the Demolition record, for my ears anyway, this is a prime Priest disc, it has so much of the classic Priest sound but moves on a bit, how do you see this one against all that has come before? "Priest is just a love, a sincere love for metal...so it is very genuine in our case and that is why we have been around so long, and people realize that." and you can't please everybody and there will always be a percentage of fans, though they may be big Priest fans, who will feel the need to criticize us. After thirty years I can take a bit of criticism as long as it is constructive, but I do have to tell you, when we get it right it is gratifying really. KNAC.COM: For as much as I personally was in love with this disc from first listen, I do have to admit that nearly all of the advance press on the disc was pretty harsh, but I am sure you are aware of that? 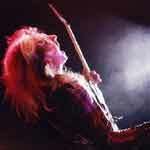 KNAC.COM: Simply as an artist, it must rip you a little to read some of this stuff because it does get personal at times? GLENN: All through our history, like, Point Of Entry, that got slammed. Turbo, that got slammed and even Painkiller got slammed and certainly Jugulator came into its fair share of criticism, but all of those albums have had nearly everybody come back and say, “You know what, I have got it now, I understand now.” (laughs) I always say, “Well, if you didn’t like it then why did you put it on again?” They can’t ever answer. And it is because it is Priest, obviously. Everybody expects something from Judas Priest’s next album and we never really give them what they are expecting, so there is a bit of shock element there and a bit of them standing back like, “Well, I am not sure here…” I have heard some really, really quite vicious reviews when it first came out and yet I have recently seen the same reviewers turn around and apologize and say, “You know, I love this album…” So, you know, everybody sees Priest in their own way and if we don’t come across like that on the next album they often need time to get used to it. I am however surprised because I think that Demolition would have satisfied a lot of Priest fans, more than Jugulator did. Any way, it has all turned out well because everyone really seems to like it now and that is rewarding. So, as I say, I don’t mind criticism if it is constructive and I actually do listen to it. A lot of people said that Jugulator is a great album but that they would like to have had some more ballads on it and we have listened to that. If the criticism is too harsh, I just know that it is either somebody who doesn’t like me or doesn’t like Priest or somebody who has been got at and I have got used to it over the years. Constructive criticism I welcome and I think that you have got some really good critics out there who say “This album is a great album, but we don’t like this track” or “ We wish that this track wasn’t on it” and that, to me, is okay, and you will listen to it and you should react to it because at the end of the day, you are trying to please the people out there. With Priest, it is difficult because if we evolve too quickly we upset the stalwart fans and if we don’t evolve quickly enough we don’t gain any new fans and we will fall by the wayside. KNAC.COM: Have you seen the reaction to that in the fans that are showing up at the concerts? GLENN: Yes, and it is great because if you go to a Priest concert you get fourteen year olds and forty year olds. It is a great cross section of age so we must have done something right over the years. More young people than you would expect, really, for not having been around for three or four years. I never cease to be surprised at the young generation that are into Priest. A lot of them are turned on by their parents, but the more amazing thing is that they have picked up on the band by themselves. I think that we have gained a lot of respect through the years and I think that you will find that nearly every metal band out there will cite Judas Priest as one of their influences and the young kids read these magazines and then they check us out, judge us, like us and then come out to see us. Ultimately they feel that we are just as acceptable in today’s metal scene just as we were thirty years ago. I think the fact that a lot of the younger bands are very complimentary about us, points us out to that younger generation. I also think that Priest’s music, in its own way, is not dated really because some of the songs are just classic songs and have stood up to the test of time. I can’t pat myself or anyone else on the back for that, that is just the way that we write, it is just a stroke of luck really. KNAC.COM: In terms of sonic texture does Demolition represent your “ultimate” sound or is it just another flavor for you? GLENN: I wanted a very earthy, gritty guitar sound and everything is naturally recorded in terms of the backbone of the track, the meat of the track, you know, the drums and everything and then we layered effects on that. When we do that, I am a bit like a mad professor with it, I can work all day on one sound and one effect but basically I just wanted the album to sound earthy and gritty and live and really get some punch behind it. You know, in the past, we have been guilty of having guitars that are a little bit too compressed or a little bit too digital or whatever but it was just experimentation which is something that we have always done, and I am not going to knock anything we have done, but this time around I just wanted the album to sound as it would be played and I think it has come across like that. I hope so anyway. GLENN: (Laughing) You noticed that, eh? Obviously you are talking about “Bloodsuckers” and I think that it was fair to do. I have left it for over ten years before I commented on it with the platform that I am allowed to speak on. I have said my bit, I guess, on “Bloodsuckers” and in no uncertain terms, just like they had the right to put us on the dock and accuse us of things that we have never done. At least my accusations are true and they bear a basis in fact and deeds done. I think that it is fair enough to have if not maybe the last say, because it will be an ongoing thing, but we do put our argument forward there. KNAC.COM: Still, it does seem a battle that can’t be won, I mean, they can quite literally threaten your life, liberty and ability to earn a living whereas you can only give a commentary on the whole thing? GLENN: Yeah, I mean, when you are put on the dock and they say, “People have died at your concerts, haven’t they?” and you would like to say, “Well, not directly but over thirty years maybe there has been a road accident outside or something…” and when you do try and say that they go, “Answer yes or no please!” and you have to say “Well, yes.” And that is it, and then you are judged. Whereas at football games or anywhere else there are going to be things that happen, you know. We have had a great record of safety over thirty years but the truth is twisted and you are not allowed to say what you want to say, you can only give “yes or no” answers and it paints you with a black brush. We have only ever tried to do good things and I think that our music has always done good things. We have had so many letters and e-mails that say thank you for our music and helping people get through bad times and that is the same with all music, not just Priest. It always acts as a scapegoat, music does. People are always chasing music to try and put the blame on it for one thing or another, and it is unfair and unfounded. KNAC.COM: You wrote Jugulator yourself? 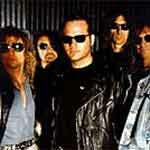 KNAC.COM: Right, and this time out it was much the same except you did co-write a couple of the tracks with Chris Tsangarides? KNAC.COM: I noticed that Ripper has contributed lyrics to some songs but not on the album itself, what is happening there? GLENN: The thing is, and I have got all respect for Tim and he is ready to write for this band, but this is only our second studio album and he knows that there is a tried and tested formula that has been in place for thirty years, so he said that he wanted to be really comfortable with the situation before he got too heavily involved with the song writing, and so he stepped back really. He is capable of writing and I think that from this point on, you will see him emerge more and more as a songwriter with the band. KNAC.COM: I know that Ripper has basically achieved one of his dreams simply by becoming the lead singer of Judas Priest but how ‘bout you? Have you achieved all that you have wanted to achieve? With Priest, with Ripper or with music in general? GLENN: I am always looking forward to the next album, you know? I don’t write on the road, but I do get little ideas while I am on the road and it makes me excited for when I get back so I am already looking forward to the next Priest album. The thing with Tim is that his voice is so versatile and he has such a range and is so talented and has areas of his voice that are still untapped! I drive him mad sometimes, pushing him to his limits, but he has no limits really so it is wonderful and his voice is just a fantastic tool to work with. He is not frightened to attempt anything that he suggests or that he would come up with himself, he is just wonderful to work with. GLENN: Who knows, we may get our population of female fans back again! (laughs) They certainly wouldn’t be looking at my face nowadays. I think that the further away they are from me the better it is. 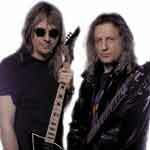 KNAC.COM: The next immediate project for Priest is actually a live DVD, is that right? KNAC.COM: Will this be something other than a straight live DVD? GLENN: Yeah. There is a lot of backstage footage on there and we recorded a live show at Brixton in London which is two and a half hours, and we have extracted an hour and a half worth of music out of that, maybe more, and then we are going to intersperse that with interviews and backstage shots, bus shots and that. It is just to give people an idea as to the character of the band and some things that I think will come across as quite amusing. It is great and it shows a different side of the band and we even went back to Turbo and “Running Wild” so we have a lot of our earlier stuff on there. I think it will turn out well at least from what I have seen of it. I don’t think it would be too special if we just did a third live Priest video which this would be, so we have tried to make it more interesting by doing some older songs and such. KNAC.COM: I am in Detroit, and from what I have seen posted that is the last date of the North American tour, is that right? GLENN: If you say it is -- I have a terrible memory -- but we are coming back in the summer as well. We are going to Europe after this first leg and then back here in the summer to do some of the sheds and basically carry on promoting Demolition and just giving people Priest music basically.